While I am busy, busy, busy getting ready for my little bakery space debut, I shall keep you ever-so-entertained with some of the stuff I was up to during my internet vacation at the end of 2013. I made these for a friend for Christmas and could not share them till after they were gifted. She bought a whole new bedroom linen set and these are for her nightstand beverages. those coasters are delicious. I went to look at Tea at Weasel’s blog (and it looks gorgeous, she sounds like a keeper!) 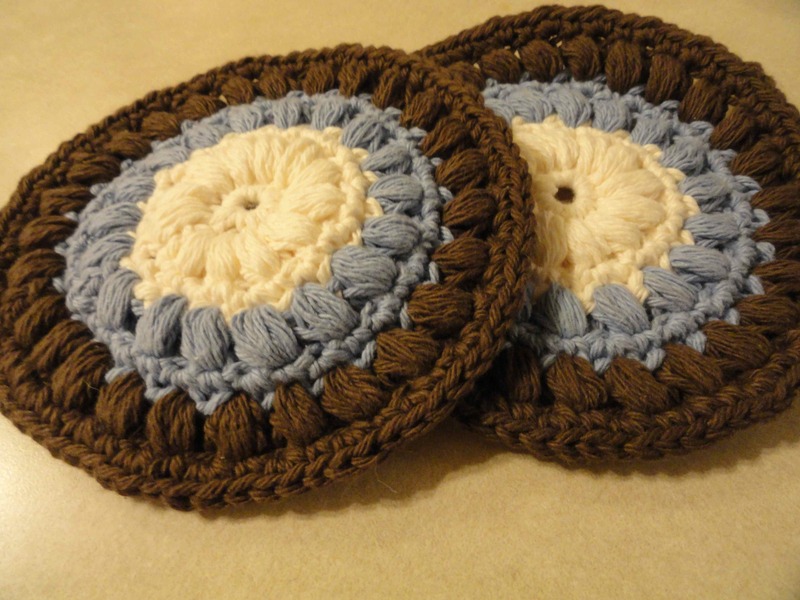 but I don’t see the pattern – she said she made them from a pattern for a rug, just did 1st three rows. Did you make the pattern up yourself just from looking at them? Just incredible! You’re really getting damn good at this crochet thing, ya? Love them! Clusters are good for coasters. They are! And I made them in a chunky cotton, so they should do a good job.